OBJECTIVES: Seriously ill patients often suffer from disorders of salt and water balance and present with clinical signs of either dehydration or oedema. The relationship of hypoalbuminaemia to oedema is complex and controversial and formed the central issue of this study. SETTING: Medical wards of New Somerset Secondary Hospital, November 2004. SUBJECTS: 50 patients admitted consecutively to the medicalwards at New Somerset Hospital were evaluated; 26 males and 24 females participated. OUTCOME MEASURES: An attempt was made to correlate causesof salt and water imbalance with the clinical assessment ofvolume status, oedema formation, nutritional state and serum albumin levels. RESULTS: Hypoalbuminaemia was not related to oedema inthis study. 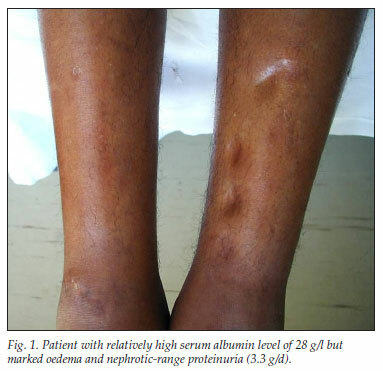 Of 24 patients with a serum albumin level below 30 g/l, only 6 had oedema. These patients all had other abnormalities that could have resulted in the oedema, notably primary salt retention by failing kidneys, cor pulmonale and malignancy. None of the patients with serum albumin levels below 15 g/l had any signs of oedema. The combined insult of a chronic inflammatory disease and malnutrition had a marked effect on serum albumin levels. CONCLUSION: Significant hypoalbuminaemia was present in many of our patients, yet oedema was detected infrequently and generally had an easily identifiable cause not related to low albumin levels. Most patients with hypoalbuminaemiapresented with normal or positive water balance. This study supports the notion that hypoalbuminaemia is infrequently associated with oedema and plays a minor role in its formation. Fifty patients admitted consecutively to the medical wards of New Somerset Secondary Hospital were studied. An attempt was made to correlate causes of salt and water imbalance with the clinical assessment of volume status, oedema formation, nutritional state and serum albumin levels. Total body fluid balance was assessed by two independent observers who recorded the extent of oedema formation on a scale of 0 to 4, tissue turgor on a scale of 0 to -3, and by paying attention to the jugular venous pressure and pulse rate, blood pressure and signs of pulmonary congestion on the chest radiograph. Dipstix urinalysis was done on all patients. Albumin levels were measured only as part of routine clinical management, so some patients with hypoalbuminaemia would therefore have been missed. All findings were recorded anonymously after patient consent had been obtained. Ethical approval was obtained from the local ethics committee. Hypoalbuminaemia was noted in 26 patients, largely in association with tuberculosis: all 13 patients with this diagnosis had serum albumin levels below 30 g/l. Despite this, only 2 patients presented with oedema. The first patient, with a serum albumin level of 16 g/l, had pulmonary tuberculosis (TB) with cor pulmonale and a haemoglobin concentration of 8 g/dl. The second patient, with a serum albumin level of 28 g/l, had TB and clear signs of volume overload with an elevated jugular venous pressure and moderate hepatomegaly. The combined insult of a chronic inflammatory disease and malnutrition appeared to have a marked effect on serum albumin levels. The average serum albumin level for the 19 wasted patients was 22 g/l, compared with an average of 20 g/l for the 11 patients with TB and malnutrition. The average serum albumin level among well-nourished patients was 26 g/l. Patients with renal impairment and proteinuria (>1 g/l) generally had less severe hypoalbuminaemia, with an average serum albumin level of 27 g/l. Sixteen patients had impaired renal function, yet only 4 of these patients presented with oedema. This finding was surprising as the expectation would be to find salt retention and a higher prevalence of oedema in association with poor renal function. Hypoalbuminaemia was not related to oedema in the study patients. 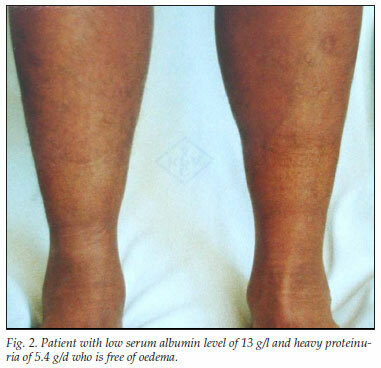 Of the 24 patients with a serum albumin level below 30 g/l, only 6 presented with oedema (Table I). These patients all had other abnormalities that could have resulted in the oedema, notably primary salt retention by failing kidneys (creatinine levels 676 µmol/l, 1 276 µmol/l and 168 µmol/l respectively), cor pulmonale and malignant disease. None of the patients with serum albumin levels below 15 g/l had any signs of oedema. This discrepancy between hypoalbuminaemia and oedema is clearly illustrated in the Figs 1 and 2. Fig. 1 shows a patient with marked generalised oedema and nephrotic range proteinuria (3.3 g/d), yet the serum albumin level was relatively high at 28 g/l. The patient had clinical signs of fluid overload and was being treated with furosemide 120 mg/d. In contrast, Fig. 2 shows a patient with a serum albumin level of 13 g/l and heavy proteinuria of 5.4 g/d, yet this patient is oedema free. This patient was not taking any diuretics. Most marked oedema was seen in patients with malignancy, cardiac failure and renal failure and was often associated with signs of volume overload. Hypoalbuminaemia cannot directly cause oedema by fluid extravasation as there is insufficient intravascular fluid to cause any significant expansion of the interstitial space.1 The theory that fluid extravasation due to hypoalbuminaemia commonly leads to a contracted intravascular volume that results in stimulating secondary renal salt-retaining mechanisms can be refuted, as the majority of oedematous patients are normovolaemic or have signs of volume expansion.2-4 This was also noted in the current study. Hypoalbuminaemia may also occur in the absence of significant proteinuria or renal disease, as often occurs in association with liver disease, inflammatory states and malnutrition. Such patients do not have a mechanism for primary salt retention and could be evaluated in relation to oedema formation independently from primary renal salt retention. The supposed direct link between hypoalbuminaemia and oedema is proving to be too simple an explanation for an age-old enigma. Significant hypoalbuminaemia was present in a substantial portion of the patients included in this study, yet oedema was detected infrequently and when present generally had an easily identifiable cause not obviously related to low albumin levels. Most patients with hypoalbuminaemia presented with a normal or positive water balance. This study therefore supports the notion that hypoalbuminaemia is infrequently associated with oedema and plays a minor role in its formation. What is already known on the subject? Medical teaching on oedema usually focuses on Starling's equilibrium, ascribing much significance to decreased plasma colloid osmotic pressure in oedema formation. Numerous experimental models have attempted to demonstrate the mechanism of oedema formation. The two prevailing hypotheses are the so-called 'overfill' (oedema formation by primary renal salt and water retention) and 'underfill' (decreased plasma colloid osmotic pressure leading to a fluid shift to the interstitium) hypotheses. This study provides clinical evidence in support of the 'overfill' hypothesis and demonstrates that hypoalbuminaemia does not cause oedema directly.